As we are working away here at Service Course headquarters, we’re slowly improving our processes and implementing customer requests for how we can offer better service. We can now check another one of those items off the list, as we now have an online booking system on our website. 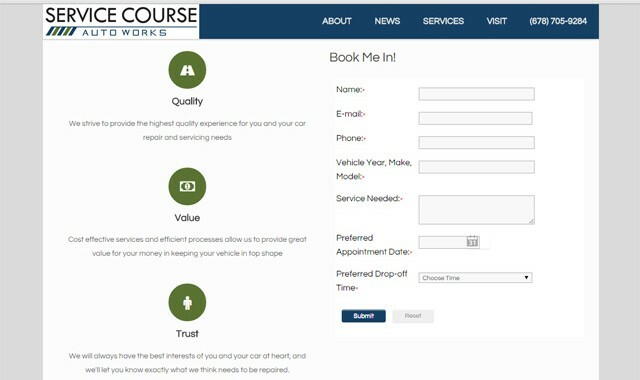 Obviously, if you’re reading this you’re already here, but if you click through to the home page: http://servicecourseauto.com you’ll see our Book Me In! booking form. Just fill in the details, give us as much info as you can about what you need and submit away. We’ll get notified of your request and if available, we’ll confirm your appointment, and if that particular time and date is not available, we’ll let you know what options we’ll have available for you as an alternative. So book away, and as always we’re here for you: This Way For Service!